We’re experiencing artificial intelligence every day of our lives, even if we don’t know it or just take it for granted. Whether it’s Spotify using machine learning to give us a better music playlist, or Apple using natural language processing to make Siri our digital assistant, AI is truly everywhere. As the leader of Salesforce’s Marketing and Analytics Clouds, I want to outline what exactly intelligence means for marketing and analytics professionals. Starting from the top, we all know and can understand that customers expect faster, smarter, more personalized engagement. But delivering on these expectations is challenging. The technical complexity and resources required to deliver AI prevent all but the largest companies from leveraging AI in their enterprise applications. There are more channels to monitor, more sources to manage and more data to make sense of than ever before. And the kicker is that human computing power is no longer enough to analyze it all. We know marketers rely on insights from analytics to determine the right audience, channel, content and timing for their campaigns. However, these analytics, and therefore the insights based on them, are often based on "backward-looking" data or the highest paid person’s opinion (HIPPO). Customers’ preferences, behaviors and expectations are literally changing in real time. It's not enough to simply look at what customers did previously to make marketing decisions. We need insights from both historical and real-time data to understand what customers might do next, in order to reach them with the most personalized, relevant experiences possible. 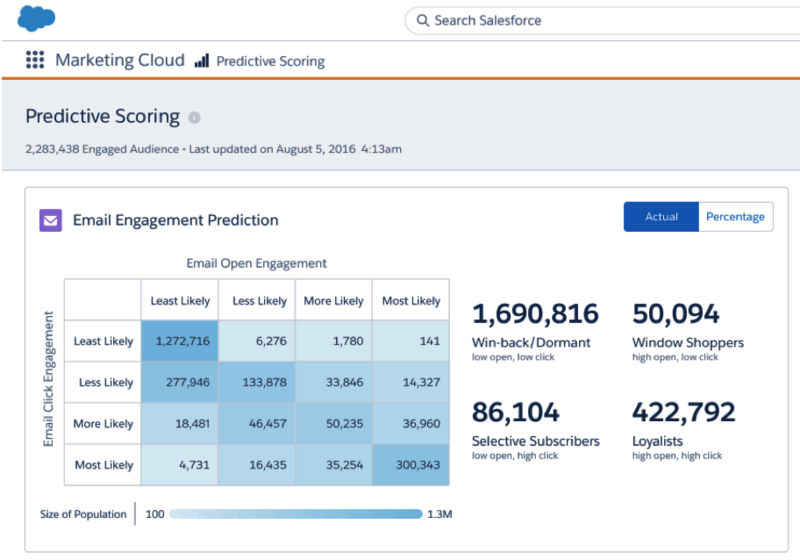 Predictive Scoring: New Predictive Scoring enables marketers to gauge how likely it is that customers will engage with an email, unsubscribe from an email list, or make a web purchase. With Predictive Scoring, marketers can determine what is driving true engagement and better anticipate the needs of every customer to deliver the perfect 1-to-1 journey. Predictive Audiences: With new Predictive Audiences, marketers can take action on Predictive Scores and build audience segments of people showing multiple predicted behaviors in common. Marketers are then able to take this insight to create the perfect audience segment to drive customers to the next level of engagement or conversion. Automated Send-time Optimization: New Automated Send-time Optimization empowers marketers to maximize email marketing ROI by automatically delivering their messages exactly when subscribers are most likely to engage. 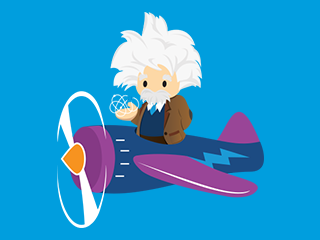 Marketing Cloud Einstein has been in beta for almost a year and we have seen some tremendous results. One of my favorite examples is the e-commerce and coupons company ShopAtHome. By redefining customer engagement around predictive scores, the company generated a 23 percent lift in email clicks, and a 30 percent increase in email opens. The key challenge to developing automated analytics is to both understand your data model and how it relates to customers and business processes. Business people also need to be able to have an unbiased perspective on the questions they need to ask, such as “what is causing a shift in my pipeline or leads?” or “why am I seeing a sudden increase in service cases associated with a certain product?”. However, people often think they know the questions that need answers, and they go and seek out data to validate their assumptions. They explore their own hypotheses first. What if you could uncover and answer every key question about your business instantly, without validating an incomplete point of view? Salesforce introduced Wave Analytics to democratize analytics, embedding insights directly into business workflows and apps, making analytics easier and more intuitive, collaborative, actionable, and accessible on any device. Since then, we’ve delivered Wave applications for sales, service, marketing, financial services and IT, as well as 20 apps from leading ISV partners. By delivering these Wave apps, we’ve helped our customers ask and answer many new questions about their business much faster than they ever could have before. Educational and trade publisher Houghton Mifflin Harcourt (HMH) is an excellent example of a company leveraging Wave Analytics to support its business. HMH saw 200 percent annual ROI by enabling sales managers and reps to easily run key performance indicator (KPI) analyses and obtain visibility into account information through customizable Wave dashboards, lenses, and charts. They have also been able to deliver new business KPIs every 6-8 weeks. This is all because they can ask and answer questions about their business faster than ever before with Wave Analytics Apps. Intelligent Wave Apps will uncover future patterns for every business process, pointing out which key findings are important to examine, why they are significant and what to do next—all without having to build mathematical models or write algorithms. Smart Data Discovery will help users find and explain insights from millions of data combinations in minutes, as well as predict patterns for every business process. 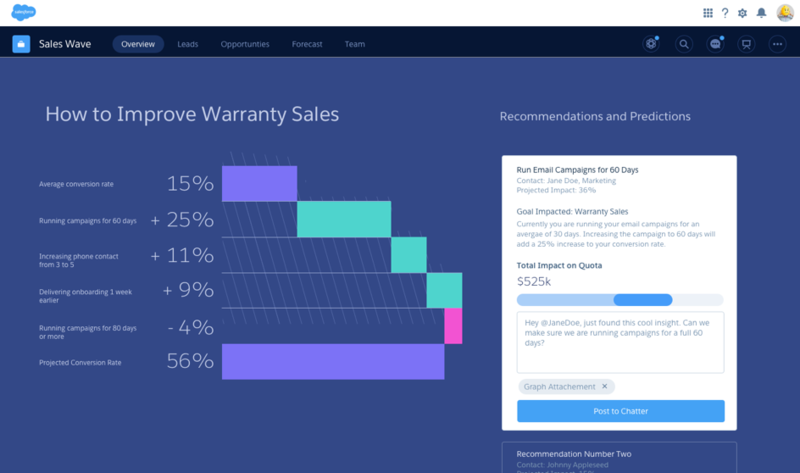 Automated Storytelling will automate and prioritize the next insight users need to know with smart charts and widgets, as well as narrate it with natural language support. A great example of Analytics Cloud Einstein in action is how we recently worked with a Fortune 500 company to reduce lapsed coverage and improve churn for their customer support offering. With Analytics Cloud Einstein, the company improved some of their most important business KPIs, such as renewal rates, campaign effectiveness, sales process effectiveness and customer experience. The result? An approximate 7 percent increase in revenue, equivalent to millions of dollars. Like AI-powered features within consumer apps, Einstein just works. Salesforce users will experience the pervasive benefits of timely insights, relevant predictions, intelligent recommendations, and automated workflows within the context of their business—not just in marketing and analytics, but also across sales, service, IT and more. 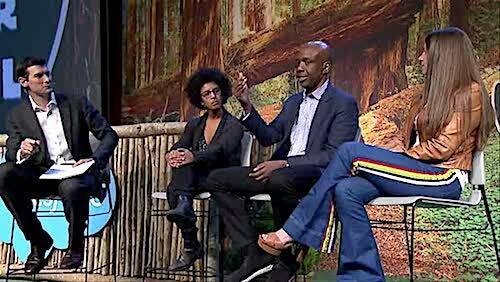 Make sure you stop by the Marketing Cloud and Analytics Cloud Dreamforce keynotes or watch online at salesforce.com/live to see these new innovations in action.